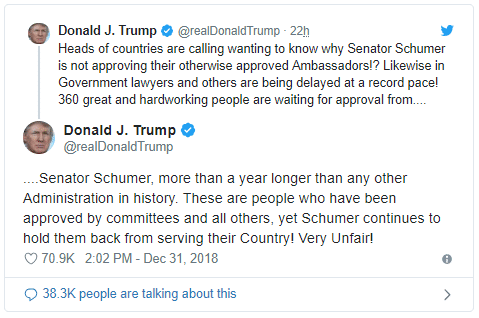 Donald sends Chuckles a New Year’s command – Schumer will never live this down. Democrats say they want to get stuff done – but it looks like they’re the lazy, do no-good party. The government shutdown is entering its second week and shows no signs of letting up. If the Democrats spent half as much time working on a resolution with the Republicans as they do on their witch hunt investigations, imagine what we could get done! But Senate minority leader Chuck Schumer is not concerned with compromising or doing his job. He and the rest of the Democrats only want to block and subvert. And Trump is calling the top Democrat out on holding up 360 men and women for political gain. “Heads of countries are calling wanting to know why Senator Schumer is not approving their otherwise approved Ambassadors!? Likewise in Government lawyers and others are being delayed at a record pace! 360 great and hardworking people are waiting for approval from Senator Schumer, more than a year longer than any other Administration in history. These 360 individuals, including ambassadors, need to be approved by the Senate so that they can begin serving our country. SHARE to demand Schumer to approve Trump’s ambassadors right away! But Democrats in Congress only want to go on vacation while the nation suffers from their inability to do their jobs. The Lefties in Congress have been incredibly conniving by staying out of Washington. This way they don’t have to meet the press or pass any legislation. It is clear that the Democrats are stalling, and will do nothing till after they take control of the House. After Nancy Pelosi becomes anointed as the new Speaker, we will see just how far the Left will go to stop everything the Republicans have been trying to accomplish. It’s ridiculous that the country is being deprived of public servants who will work with other nations for our best interests because the Democrats want to play chicken with the Right. Ambassadors play a vital role in the State Department, and the Senate needs to come back and do what they were hired to do.